The Nile Delta, an area of about 22,000 km2, accounts for two thirds of Egypt's agriculture. In the late Pliocene, the delta started to advance across a marine embayment and developed, especially in the Pleistocene, through major sea-level changes associated with glacial periods. The Nile Delta area is now the major oil and gas-producing area of Egypt. Chemical industry located in the Nile Delta is the main source of hazardous waste. Water pollution in the Nile branches as well as its lakes is caused by agricultural pesticides, raw sewage, and urban and industrial effluents. The decision of the Egyptian government to reduce the Nile water discharged to the Mediterranean is not only affecting the quantity of discharge, but also its quality. Sewage from coastal lakes and other land run-offs became the substitution source of nutrients of coastal fisheries. The limited Nile nutrient-rich sediments and water reaching the delta negatively affect both the agricultural activities as well as the functioning of the ecosystems in the coastal area facing the delta. 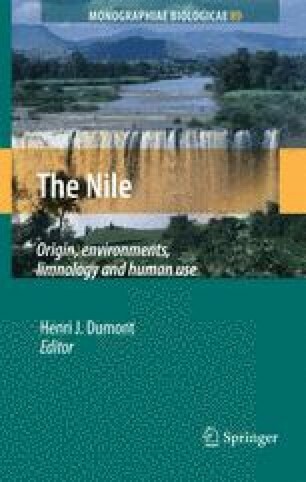 This chapter highlights the main factors characterizing the Nile Delta: the geology, hydrology, and ecology of this delta-estuary-coastal marine system are described and illustrated. It also forecasts future trends in the development of the Nile Delta and uses numerical simulations as a tool to predict future variations within the coastal area of the delta.